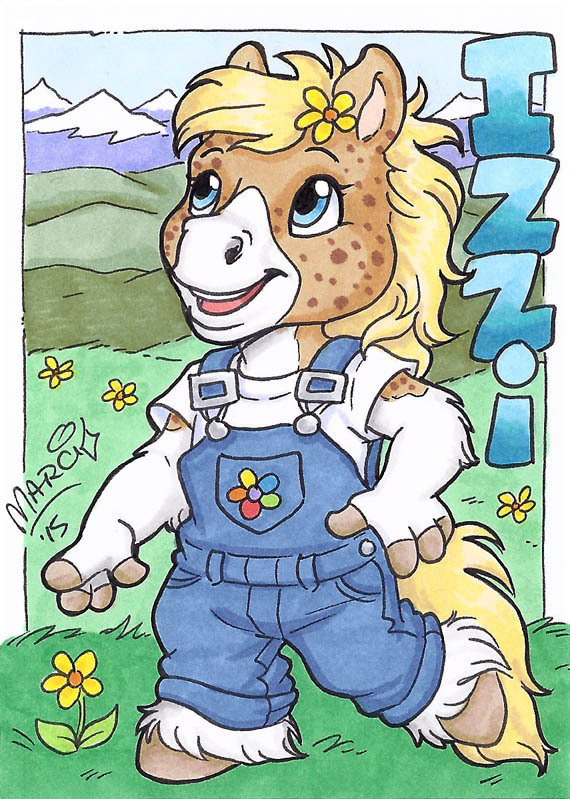 Commissions - The Art of Marci - Furries! As a professional illustrator, I am terrific at translating your character onto the page in my style. Either over email or in person at a convention, I am super easy to work with–I’ll make sure you end up with a piece of art you’re delighted with. I mostly work in Prismacolor markers, but I’m available for digital commissions as well. If you have a project in mind that you don’t see detailed below feel free to email me. I’m pretty versatile, and I like trying new things! You can pre-order a badge commission to pick up at a convention I’ll be attending, which is a great way to beat the rush (I’m usually sold out within the first hour of each day). Just shoot me an email. 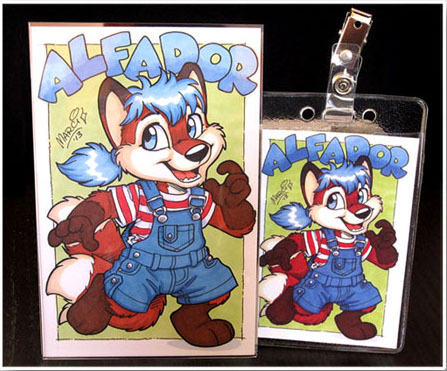 See my Badge Commission page for more information on how to commission yours today. My Premium Portrait offer is a deluxe package featuring a full-colour jumbo size 4″x6″ version of my popular character badges. See your character in greater detail displayed in a magnetic acrylic frame. A portable version is included–a 3”x4” print in a sturdy plastic holder with clip–so you can show off your badge at conventions without worrying about damage to your original. Portraits also include digital scans for you to post on FurAffinity, and a black and white version that you can have fun colouring yourself: either digitally or print it out and grab your crayons. The base price of an 8″x10″ commission includes one character with colour block background or simple element (example: standing on a patch of grass). You can add a more detailed background for $50-100. Additional characters are $90 each (up to 3 extra). Complex characters may be an extra charge (if your character has wings, or light markings on dark fur). 8″x10″ commissions are created in Prismacolor markers on Bristol. Colour reference sheets are a great way to share what your character looks like so other artists can draw it consistently. Reference sheets may include different views of your character (side, front, back), or different ages of your character (baby, toddler, child, teen, adult) at a rate of $70 per pose. You can add facial expressions at a rate of $35 per face. You can also add accessories for your character at $5 each. Available in marker or digital colouring. Paper dolls are a fun way to dress up your character, and new outfits will be added as my imagination goes wild! Choose from the animals on my Paper Doll page, or mix and match features that best suit your character. $45 includes the custom-coloured base of your character and one outfit (you can add additional outfits for an extra charge). 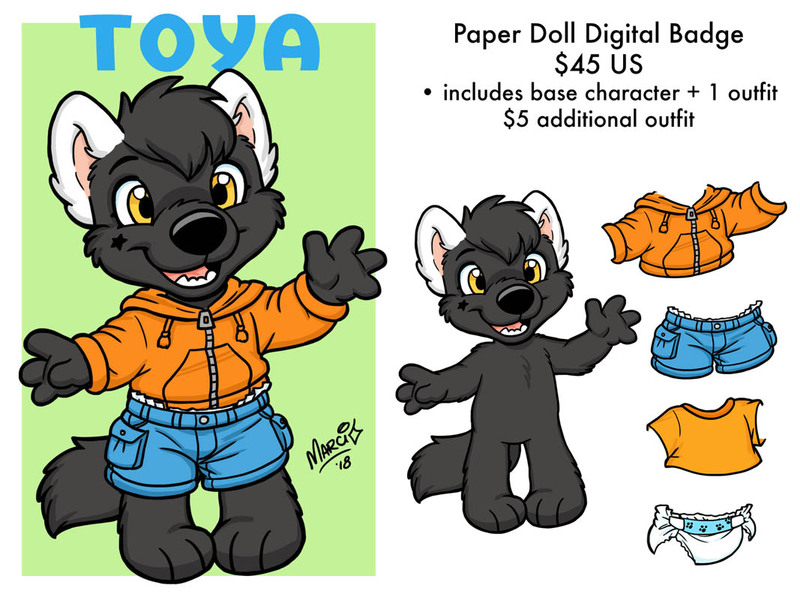 Find out more on my Paper Doll info page! Use stickers on the chat program Telegram just like you would emojis. Custom stickers are priced at $20 US for face only, $25 for head/shoulders, $30 for waist up, and $40 for full chibi body. Outfits, accessories, and detailed characters may be $5-10 extra. You’ll receive a high-resolution PNG file of each sticker (with outline and dropshadow), as well as the link to your sticker set to use on Telegram. Email me to order your Telegram stickers today! • Email me with your request. If you have reference pictures of your character, that’s wonderful, but if you don’t, I’m quite good at interpreting your written description. • Details: What is your character’s age, gender, species? What pose, expression, or outfit do you have in mind? • Payment: Once I’ve confirmed your total cost, you can send in your payment. I’ll either send you a PayPal quick link or an invoice that you can pay by credit card. • Process: After I’ve received your payment, I’ll do a pencil sketch of your commission and email it to you for approval. This is your opportunity to let me know how much you love it and can’t wait for me to finish it, or if you’d like me to make some changes (there is a fee for major changes like a totally new pose). I’ll finish inking and colouring your commission, email you a digital scan (which you’re free to post on the web, as long as you credit me), and then mail you the original. Note: I use Prismacolor markers for my traditional artwork. To preserve your commission so that it doesn’t fade, keep it away from bright light (especially sunlight).